Young tomato plants quickly transform into gigantic bushes in practically no time at all. Give them some extra support to help them grow. Tomato plants often bend, lean or even break as fruit matures. Before planting, get to know the tomato you've chosen. Indeterminate plants will continue to grow and will benefit from some support, while determinate tomatoes may be fine on their own. Use tomato cages, wood or metal stakes, or a trellis to give plants extra support. It's really a matter of preference as to which one you choose. The most important thing is that you're keeping plants off the ground to avoid pests, diseases and rot. Put supports in your garden before or at the same time you plant tomatoes. Tomatoes will be easier to maintain, prune and harvest. Trellising your tomatoes offers them support and is a great way to maximize small spaces. They keep tomatoes off the ground and allow for easy pruning. Push two 6' poles or wooden posts into the ground, about 10' apart. The poles should not wobble. Tie wire or twine between the posts, adding lines across the top, bottom and middle. Plant tomatoes along the length of the trellis. Water the tomatoes regularly and fertilize with Tomato-tone every two weeks. As the plants grow, train the stems by attaching them to the trellis using twist ties or twine. Choose 6' to 8' tall stakes made of wood, plastic or bamboo. Or create your own from recycled materials. Pound the stake firmly into the ground, about 12" deep, beside the tomato plant. Tie the stalk loosely to the stake using twine as soon as the flowers appear. The stakes will bear the weight of the plants as they grow, preventing branches from tipping and breaking. Continue tying plants to the stakes as they grow. Water tomatoes regularly and fertilize with Tomato-tone every two weeks. Cages can be purchased at your local garden center and they're easy to remove at the end of the season to be stored for next year's use. Choose metal, wooden or plastic tomato cages. Metal cages often hold up better and last longer, but are prone to rust. Choose 6' cages for indeterminate and heirloom varieties. Plant tomatoes and center the cage over the center of the plant. Depending on the full grown size of your tomatoes, set the cages about 4' apart. Push the tomato cage legs into the dirt until the bottom rung is even with the base of the tomato plant. Soon your garden will be filled with delicious ripe tomatoes! 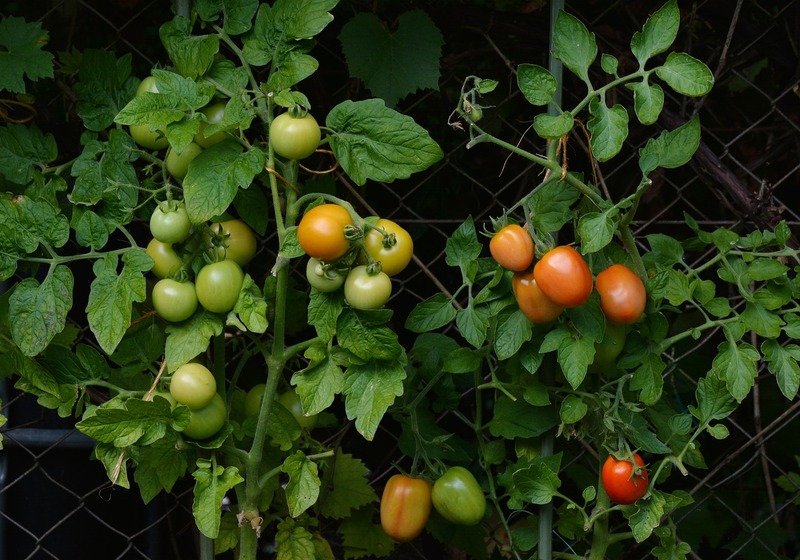 For more tips on growing tomatoes, check out our organic gardening guide!